The interesting location and atmosphere of Liberty Hall Wood-Fired Pizza in the Canal Studios building on Union Street makes the place a must-see in and of itself. The head of the large dining room is home to the open-air kitchen where salads are made, dough tossed, and pizzas assembled. It’s also where the authentic wood-fired pizza oven cooks a pie in 1 ½ to 2 minutes at a minimum 800 degrees. The smell from that stove, and the bustling crowd, drive a loud, jovial ambiance. When we arrived at 6:45 p.m. on a recent Friday, the place was so full that our party of four waited 25 minutes to be seated. Reservations are not accepted. We started with a Caesar salad ($10), and were delighted to find this gem so close to home. It was fresh and crisp and completely delicious. You could taste the anchovy and lemon in the light dressing, and the garlic crouton chips were a tasty diversion from traditional croutons. Its longevity on the table was counted in seconds, not minutes. It was the best Caesar salad I had eaten in four years, topped only by the Terrapin Grille at the Marriott Hotel in Niagara Falls. On to the pizza: Eager to sample all we could, we decided to share four pizzas for three people, and we ended up taking half of them home. So, be forewarned that one is enough, but these pies are also good cold on the next day. The wood-fired pizzas average around 12 inches across. They look a little larger than the “personal pizzas” popularly advertised by the chains. According to a FAQ sheet I picked up at Liberty Hall, the pizzas are charred, not burnt, and the chewy crust is authentically Neapolitan. Also, Liberty Hall does not slice your pie. It is served whole, with a pizza cutter alongside. The Calabrese Salami ($18) was a combination of salami, Parmesan, mozzarella and basil. The sauce was loaded with fresh tomato flavor, but the sausage was too thinly sliced for flavor, and otherwise it was just pizza. The classic Margherita ($15) was simple and well-prepared. The tomato really popped, but overall it did not inspire cheers. Chorizo ($16) featured chorizo sausage, caciocavallo and Parmesan cheeses, arugula and black pepper — a spicy and savory mix that went especially well with the Liberty Hall’s charred crust. Saving the best for last, we tried the white pizza of ricotta and mozzarella and three mushrooms (shiitake, cremini and oyster – $17). It was a silky, flavorful blend of cheese, mushroom and garlic that was really at home on the chewy crust, and left us wanting more. The dining room featured private tables along the wall, and an extra-long buffet table running down its center, where one might end up seated next to a stranger, and make a new friend. These quaint touches and ambiance are what make Liberty Hall unique, and while the pizza is fresh and different, only the Mushroom Special and the Chorizo really impressed. Desserts include Nutella pizza, ice cream, and draft root beer floats. 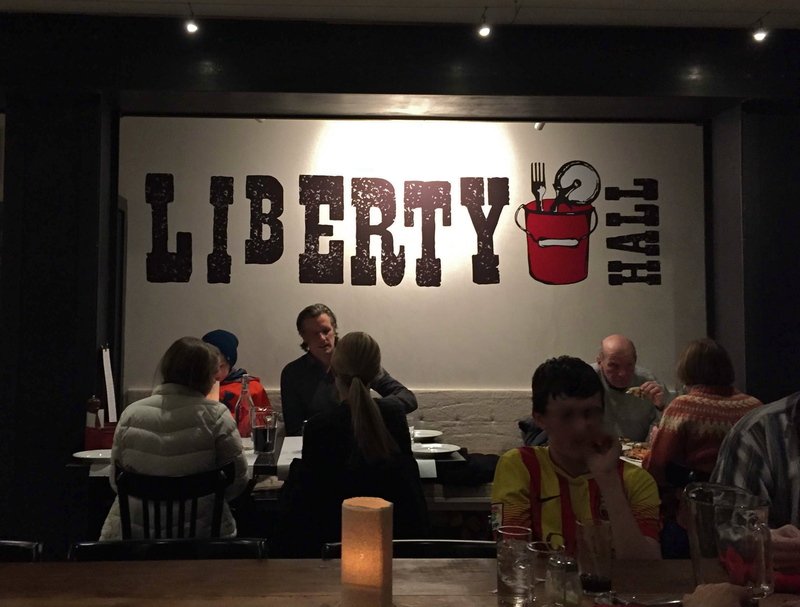 Liberty Hall is a welcome, eclectic addition to Lambertville and New Hope, and we recommend giving it a try. Meal: $97 with a pie brought home; BYOB (and glassware). Liberty Hall Wood-Fired Pizza is located at 243 North Union Street in Lambertville, and is open Tuesday through Thursday from 5-9 p.m., Friday and Saturday 5-10 p.m., Sunday 4-9 p.m., and closed Monday. Adam Duncan - Adam Duncan was born in Beirut, and raised in Virginia Beach. He entered the restaurant business at age 15, and has lived in the area for 27 years. Adam shares his life with his partner Sylvia, two teenage sons, and two extremely spoiled dogs. Love this place. Its “expensive” because they use only the top quality and freshest ingredients possible. If your looking for a good value Dominos or Pizza Hut certainly is cheaper. If your looking for an amazing dinner in the most beautiful space in town then this is the place for you. 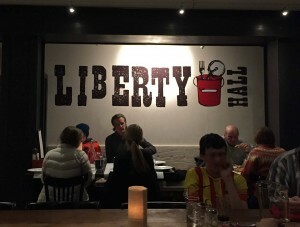 C.: Considering the quality of the ingredients, Liberty Hall is NOT expensive for pizza. 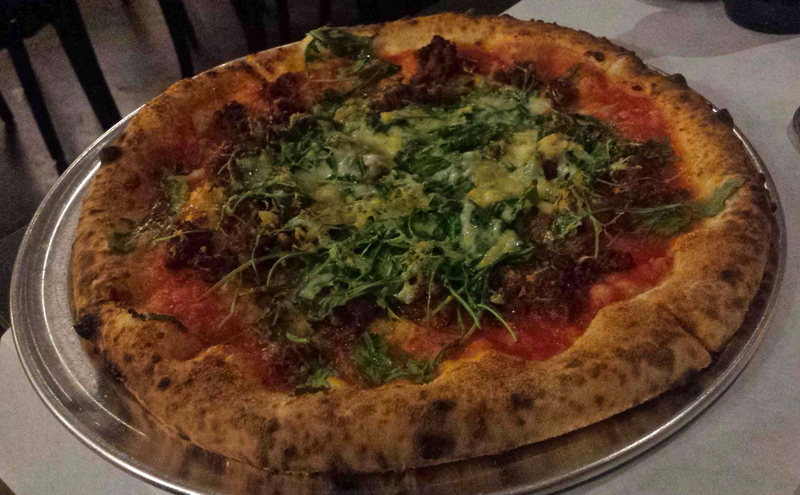 If you’re accustomed to a slice joint for pizza, the smaller pies here may seem expensive. But, the combination of imported flour, house-made sauce and fresh, quality cheese and toppings make these pies worth every penny. Wood-fired Neopolitan pizza is increasingly popular around the country right now (Nomad in Hopewell, NJ has been the sole local place to get these type of pizzas) and a $14-20 price, depending upon toppings, is typical.